Big Poppa Smokers serve the best BBQ grill & smoker selection on the internet. The company provides some of the most reliable, high quality, USA-made grills. Founded in 2009, Big Poppa Smokers started its store with BBQ rubs, seasonings, sauces, marinades, accessories, meats, and BBQ Smokers. 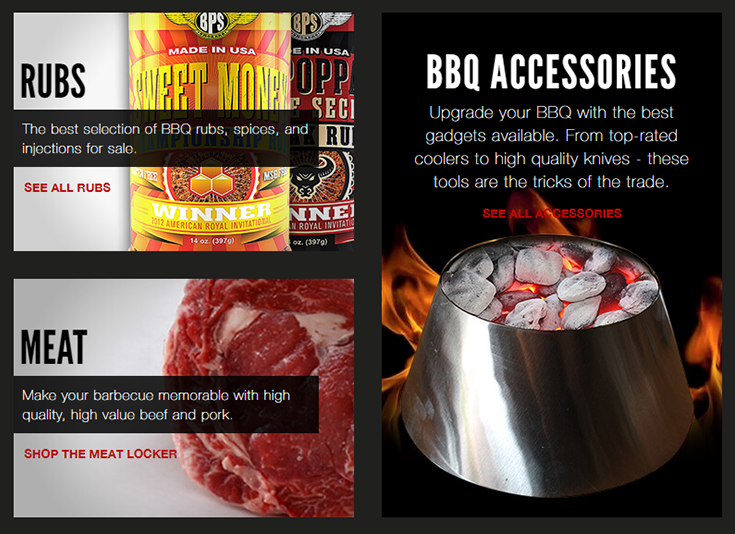 It also has a large selection of BBQ accessories like Grizzly Coolers, Top Rated Knives, Lump Charcoal, and Wood Pellets – all tested and approved by Big Poppa himself. Due to their wide range of BBQ products, they were attracting a large number of BBQ Lovers to their webstore. With the increased sales, the team decided to use a shipping management software which could automatically import and ship the orders online. As a result, they adopted ShipStation to overcome their shipping hurdles. As their website is developed on Magento, they had the flexibility to support product custom options (like Grizzly Coolers, Knives, Lump Charcoal, and Wood Pellets) on their BBQ grill products. In order to diversify their product offerings, BBQ offered product variations (custom options like Grizzly Coolers, Knives, Lump Charcoal, and Wood Pellets) on their basic products, which enabled their customers to buy more variety online. Their existing system could not track inventory based on any variation, due to this, the team was clueless about the delivery of custom products throughout the fulfillment process. Big Poppa Smokers doesn’t store all the custom products they sell online, that’s why they are required to make a purchase order and send the detailed order information to the supplier. This PO should also contain the complete custom product info. Even the dropshipment process should follow this route. Due to the manual way of managing order information, human error was unavoidable. And, as a result, they were shipping wrong goods to the customers which were affecting their brand credibility. They were lacking a central repository system from where they can keep a check on the inventory levels and manage the stock for timely fulfillment of the orders. Considering how Orderhive Enterprise can be customized and scaled according to their requirements, Big Poppa Smokers decided to adopt our solution. Their existing system was used by multiple users, so the team was not able to trace the event which triggered the inventory update. The system now provokes a notification when the quantity of stock has been updated and whenever a new order or PO is placed. Captures the reason when a warehouse user changes quantity or price of a product from inventory listing page & inventory detail page. Captures any change in quantity, price, and description made within the system. For certain products, the team required generating a PO. They are also required to notify their supplier with a detailed description of the order with customer & custom option information. Automatic creation of purchase orders from the sale orders. Notify the supplier through email as an when a purchase order is created with a detailed description of the customer & custom options. Once the Supplier ships the products directly to the customer, the PO is marked as fully received in Orderhive. For the next step, Orderhive Enterprise automatically creates shipment in Magento, invoice, payment in Orderhive and QuickBooks & also generates a receipt for the same in Orderhive. Mark the order as paid & delivered in Orderhive and Magento. This way the complete process of order fulfillment is automated by Orderhive Enterprise. Tableau offers immediate analytical insights by transforming data into interactive visualizations. This process takes only a few seconds as Tableau offers an easy to use drag-and-drop interface. For swift business insights, Big Poppa required integrating Tableau Software to their Orderhive Enterprise account. Stock discrepancies happen while comparing physical count with the stock stored in the warehouse. It was important for the team to keep this issue in check, as stock on hand is equal to cash on hand and it can have a great impact on order fulfillment process & the ROI. Now, to make sure that system reflects accurate stock level, it was important to maintain a comparative sheet that covered all the inventories held in the sequence with the physical location. They needed a customized feature, where the management can have an instant notification about any stock update with the correct operational details. For e.g. when they receive any POs, the stock level gets automatically updated across the Orderhive and Magento, so the Orderhive Enterprise system should be able to capture the inventory transaction details and record them for future access. Big Poppa needed an integrated platform which enables two-way sync between ShipStation and the centralized system, so any shipping updates/adjustment including void shipments details can be easily transferred. Whenever a PO is raised by the team, they wanted a customized PO closing process, where they can close the PO before receiving the full consignment. Tableau can access the database on Big Poppa’s dedicated server and generate real-time visual analytics quickly. Orderhive Enterprise designed a process, where a physical count comparative sheet/metrics (on monthly, quarterly and annual basis) is generated which displays the difference (Variance Quantity) between the actual physical stock located in a particular location against the stock counts maintained in Orderhive. Big Poppa users can filter the stock metrics on the basis of category and warehouse, depending on the filtration parameters, Orderhive will fetch records and will display stock items in QTY units. The stock items will be segregated by physical stock units and system stock units, Big Poppa can update and validate the physical stock units as and the system stock units from a single dashboard. Orderhive Enterprise implemented a feature, where Big Poppa can access the “Transactional history of an Inventory operation”, with any inventory update the Orderhive system records/capture the inventory operations details and store the report in the system for further access. Orderhive Enterprise instantly retrieves the latest shipping details including the cancellation details from ShipStation and update the customer with the new tracking. no via an email. Orderhive Enterprise, the new shipment detail is being sent as per the specified format described by the team. With this Big Poppa has a more streamlined process to handle void shipments without disrupting the fulfillment process. Big Poppa can close partially received orders, under received order and over received orders. Send notification to the warehouse about the partial & full shipments of orders, which allows the warehouse staff to process the goods for outbound delivery & keep a check on the inbound delivery.